Nuke Pro: Polar Ice Caps -- What is the Real Truth, or is this part of Climate Gate Also? 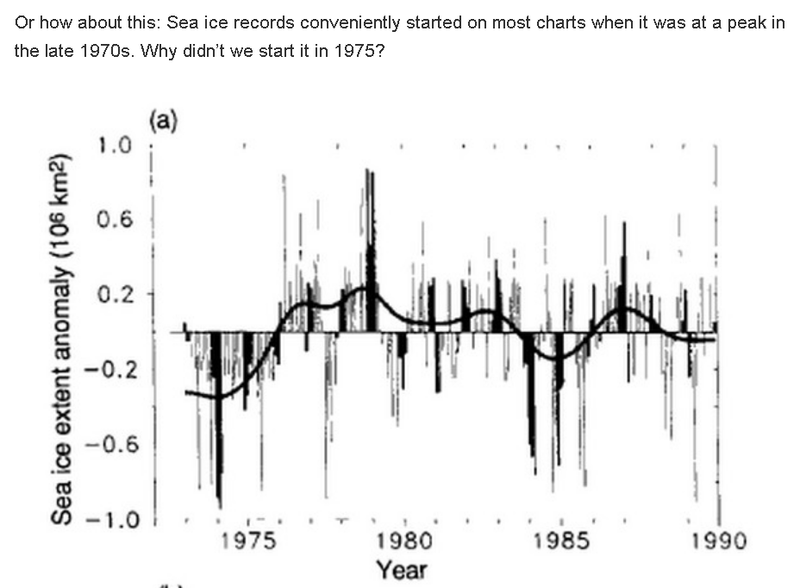 Polar Ice Caps -- What is the Real Truth, or is this part of Climate Gate Also? The Ice Caps deserve some research. The Nuke Promoters use Global Warming, CO2 Warming and Acidification of the Ocean, and Melting of the Ice Caps, to promote nuclear radiation plants as the only way to Save the Earth. 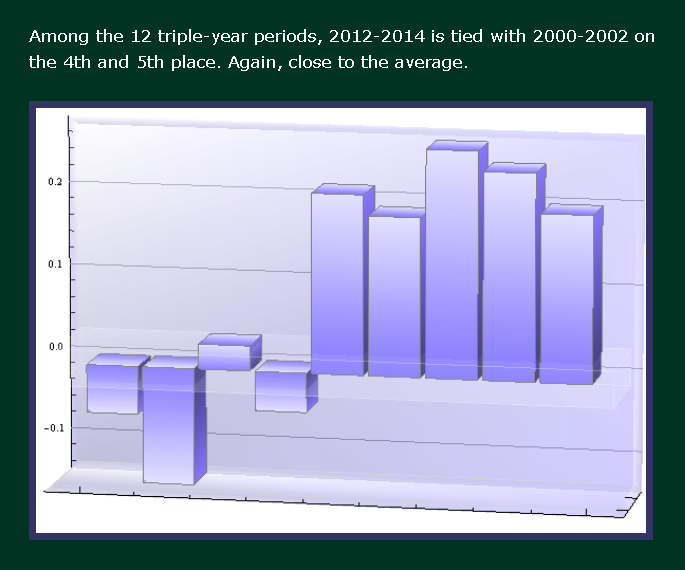 This site has some great discussion on Global Cooling, and charts to prove it. The Arctic is the North Pole, The Antarctic is the South Pole. In general the Northern Hemisphere has seen small temperature increases in the last 20 years, the Southern Hemisphere has seen temperature decreases. 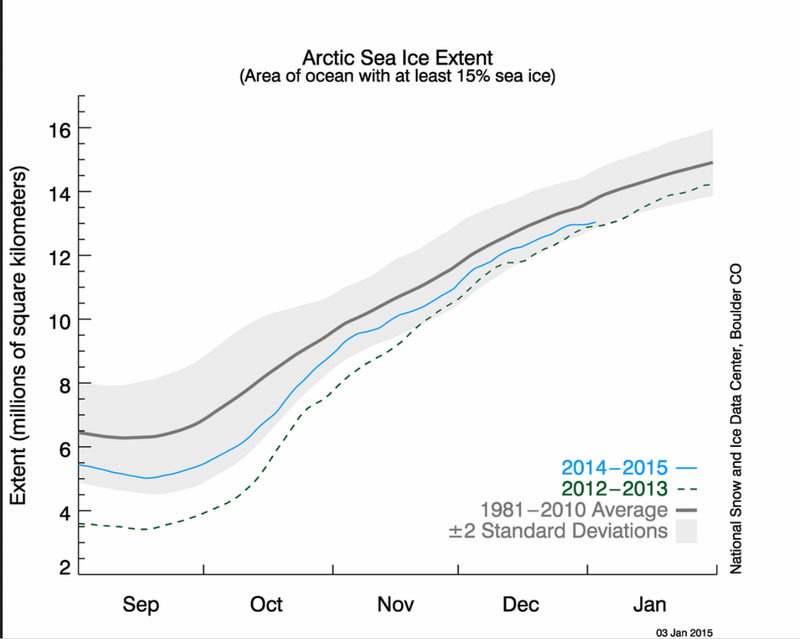 We expect any ice cap melting to be worse on the Arctic than the Antarctic. This chart is updated often by the "National Snow and Ice Data Center" shows that there is a lot more ice this year than 2 years ago. And the shaded area, the so called 2 Sigma band (2 standard deviations from average) is a useful band to put things into context. Many natural processes can use a 2 sigma band to signal when a "real change" has occurred, as opposed to just normal variations. Now the 2 Sigma is not perfect for every 'system', some systems have larger natural variation. We are now in "natural variation" if 2 sigma is correct for this "system"
Don't Clam up when it comes to the TRUTH! While government science and media begin the ramp-up to claim 2014 as the “hottest year ever” China’s Sea’s biggest bivalve shows that the Middle Ages were warmer than today, when Carbon Dioxide was lower. The graphic accompanying the article contrasted the expansion of the Arctic sea ice extent from May 26, 1969 to May 26 of 1974. 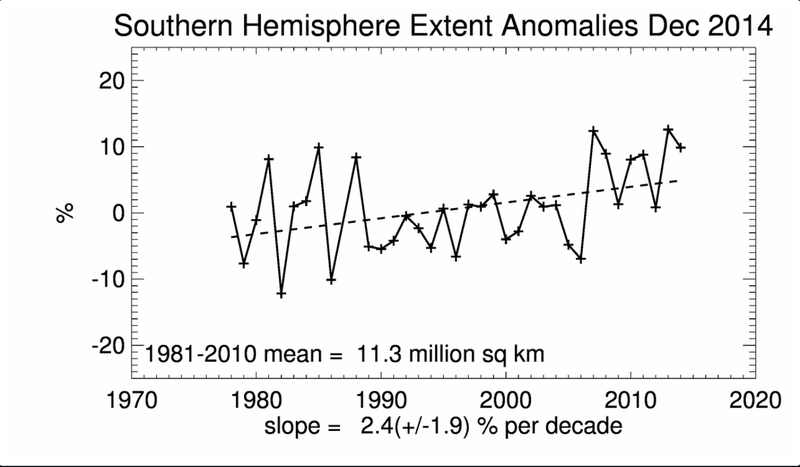 With the new data here, and what Anthony alerted all to (well, all except the national media) to in 2012 . .
. . . one should be able to construct a rather accurate account of the natural variability in cycles of sea ice extent of the Arctic region. stock here---Just this year they "discovered" old satellite photos of earth from Nimbus 1,2,3,4 satellites. 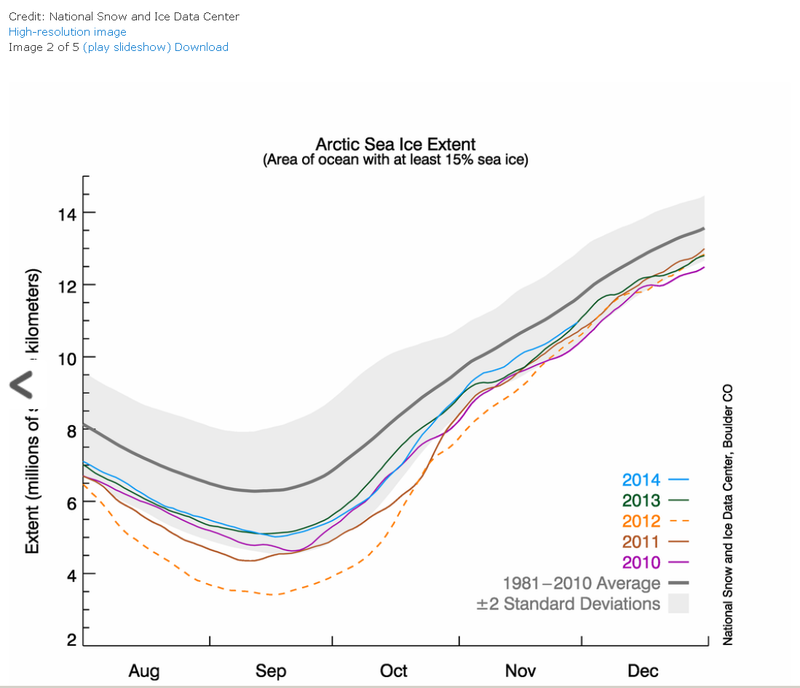 Ideally someone with LOTS of free time could peruse and calc sea ice levels. You can "order" the data here, there is no cost. “enormous holes” in the sea ice!?! – Congratulations on discovering something that has long been known. 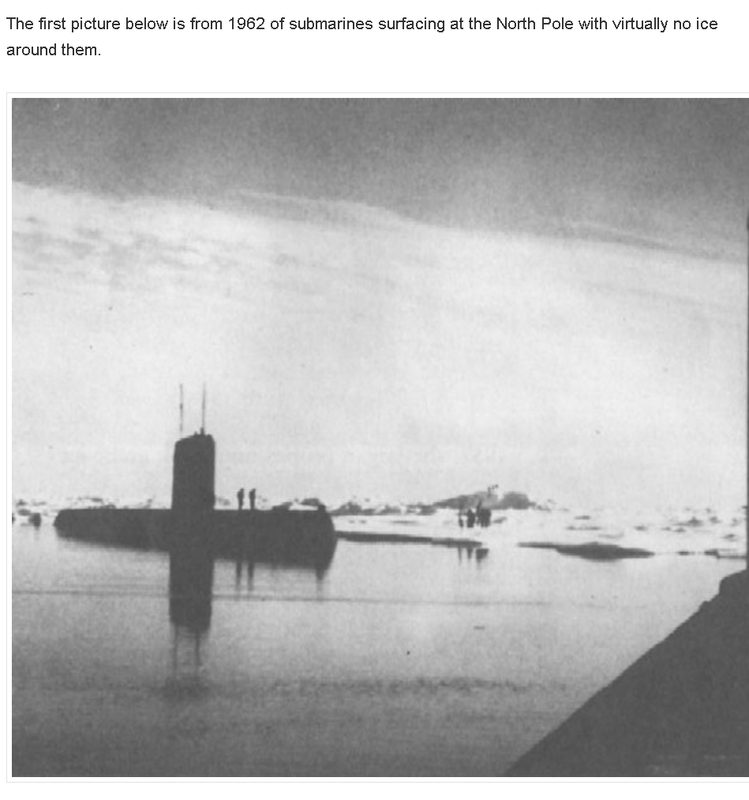 With over 40 deployments north of the Arctic Circle aboard U.S. & Brit nuclear subs (’75 – ’09), I can categorically testify that this has always been so. The September 1964 Arctic sea ice extent at 6.90M km2 also indicates that all the historic sea ice reconstructions estimating the Arctic minimums use to be at 10M, or 9M or 8M in the past were just way-out faulty alarmist propaganda. Some of the reconstructions are being fixed now but you will often still see the out-of-date wrongly estimated ones. Point out this fact whenever you see someone try to post one. A couple of weeks ago I detailed in this article hundreds of science and news reports demonstrating that arctic ice levels in the 1920 to 1940 period was not dissimilar to today. A Fox News/O'Reilly climate change denier has her mind changed by the movie 'Chasing Ice', currently in limited release. Visit http://www.chasingice.com/showtimes for screenings around the country. Watch Chasing Ice.. it is highly recommended. Stock.. have you seen it yet? A moneymaker that fell through due to the facts: ice is NOT melting at the rate HOPED for by those intending to profit from it. When mainstrem media & corporate mouthpieces like the UN & all the think tanks try to confuse you on a topic, know in your heart that it is entirely a scam. The energy companies, mining companies as well as those companies that meant to profit by making the necessary equipment needed to traverse the Arctic are now admitting that ice is increasing there not decreasing. And only admitting it becasue they lost their new moneymaker. They helped spread the news that ice was melting in order to convince mining & energy companies et al to invest in the Arctic. It was a sales pitch noting more. "Predictions of increased ship traffic in the wake of diminished Arctic sea ice Arctic waters may have been premature, said Malte Humpert, executive director of the Arctic Institute, a Washington, D.C.-based think tank. "I think 2014 kind of shows that development and Arctic shipping may be further off than we might have thought a few years ago, that the ice is not melting as quickly as previously predicted," Humpert said. "More ice formed in 2014, and the nature of shipping changed."